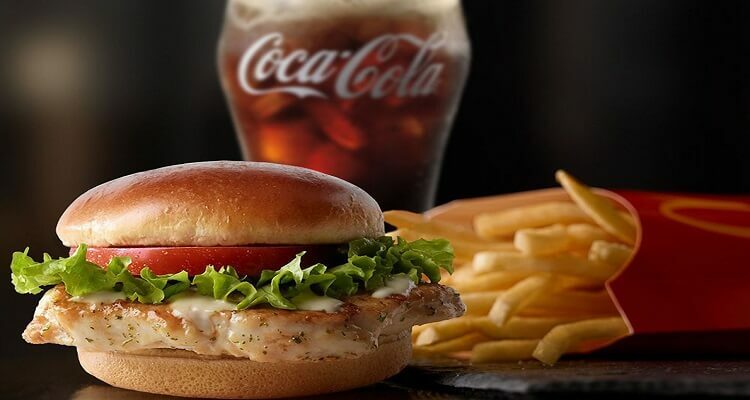 McDonalds is one such chain of fast food outlets, which has spread all over the globe, introducing yummy and delicious foods, suiting the taste buds of the people. It has find its own way of competing and surviving the international markets. Here is a mouth-watering tour of food items on the menu of McDonalds. However, there can be many a foods that may taste just as delicious; however, I have tried my best to come up with a good list that can be credited. I’m Lovin it .. what about you? The shrimp burger is called EBI Fliet O in Japan. In Hong Kong, its titled shrimp. The hamburger is shrimp embedded in breads, served on a big Mc roll. This blend of eastern and western flavors had been successful. The EBI Fliet O generated sales of 10 million in the first three months after its launch in October 2005. This veg item on McDonalds menu is quite different, designed especially to match the requirements of Indian people. However, it is available in non veg version as well. The rectangular crust topped with creamy sauce, curried vegetables including broccoli, baby corns, mushrooms and bell paper, all baked. Great! The pan is available with or without chicken. the curry pan is enough to fill the stomach that too with high nutritional value. It adds 377 to your calories, giving you high energy as well. This Asian rice burger, popular in Taiwan, Singapore, Indonesia, Philippines etc. is another great food from McDonalds. This yummy and nutritional burger is actually made with rice cakes, hope if you hearing about it for the first time, you do not assume that you will have to eat with your hands. The rice is actually transformed into buns with beef or chicken between them. I guess, parents would want their children to go for this nutrition-valued fast food. This yummy dish on the list is from Egypt. However, it can also be found in the Middle East. There are two versions of McArabia: grilled kofta and grilled chicken. The grilled kofta is actually beef with spices. The ingredients are wrapped in Arabic Style Pita Bread. The filling comprises of lettuce, tomatoes, onions and garlic mayo. Talking about the nutritional value, one such sandwich contains 566Kcal, carbo being 50 g, proteins being 24 g and fat being 30 g.
It is a hamburger sold at McDonalds in New Zealand. The burger was introduced by McDonalds in 1991, since than being a loved fast food. The product got discontinued in 2004, however was reintroduced in 2007. In 2008, the burger was discontinued, but again relaunched for a limited time. Omg! Story of introductions and closures. In 2011, it was finally introduced again. A dish from Spain, is a soup. It is the refreshing and cool soup, made up of raw vegetables. The base starts with olive oil, vinegar, water and bread cubes. The other ingredients vary. The tomato-based soup from McDonald’s comes in a carton made by PepsiCo. Though it is not the only soup from McDonalds, there is Babur ayam in Asia, but the Gazpacho is colder, in fact the coldest. For this delicious dish owes to Mexico. The utterly delicious combination of English muffins topped with fried beans, white American cheese and Salsa. Yummy! However, these mollets are different from the traditional ones, as the latter one is made with home rolled dough, crispy outside and soft inside. Also, the traditional ones have a different type of cheese, fresher white. The dish is sold at McDonald’s in Japan. It is here where teriyaki sauce developed, therefore, the people of Japan are in love with the dish. The burger is made of two big pork patties, 2 sesame buns, and one bun in the middle, lettuce, cheese and teriyaki sauce within, perfect combo, and mouth watering delicious, enough to fill your empty stomach, but surely you would love to have another. The dish is from Costa Rica. It is their national dish. The dish is simple yet delicious to taste. You can find this dish in their local restaurants. The dish is fried rice and beans, taken primarily for breakfast. Beans are cooked, until the juice is wholly consumed. McDonald’s serve it with scrambled eggs and sour cream as well, which is yet another delight to taste. This is not a dish. Actually, McDonald offer weddings in Hong Kong. The McDonald’s offer hosting reception parties for the couple. The party is hosted in a restaurant, where the cake is the stack of apple pie and the guests and the couple feast on fries and shakes. The decorations are done and music is played, making it more like a wedding.